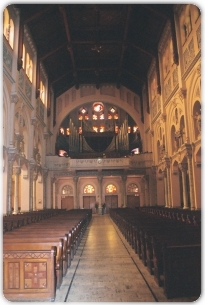 Lemieux & Associates prepare the Organ at St. Anne's Church and Shrine in Fall River, MA, for the churches 100th Anniversary Concert which took place on April 30th, 2006. The concert of choral and organ music featured the Bristol Interfaith Choir (Joan D. Roth, Director) and Organist Jonathan Davis. In addition to accompanying the choir, Mr. Davis played Franck's Piece Heroique and a piece of his own composition dedicated to Normand Gingras, Organist of St. Anne's for nearly 50 years. St. Anne's is the largest church in Fall River. The three manual, 85 rank Casavant, Op. 2796, built in 1963/64 contains complete principal choruses in all division including the pedal. Each chorus contains two mixtures! This is perhaps Lawrence Phelp's purists neo-baroque tonal designs ever conceived, however interestingly enough it was described as 'Modern French Romantic' in the original contract. Lemieux & Associates has been caring for the instrument over the last several years, and have performed selective restoration work including releathering, Pittman valve replacement, and other repairs. This organ was also featured at the Summer 2005 Southeast Massachusetts Organ Historical Society Convention in a concert by the group Sine Nomine (Glen Giuttari, Director), with Andrew Galuska, Organist. The concert ended with a stunning performance of Poulenc's Gloria.